When you buy a new home or make household upgrades, you might be offered a home protection plan or home warranty. But if you already have homeowners insurance and product warranties, do you really need more coverage? Protection plans and home warranties are fundamentally different from homeowners insurance, which typically protects homeowners from a limited range of risks like fire, weather-related damage and theft. And unlike a product warranty, which has a fixed term that begins on the purchase date, protection plans and home warranties can be renewed indefinitely. What Is a Protection Plan? A protection plan is a service contract that guarantees maintenance, repairs or replacements for major household systems at no additional cost. Many plans include routine maintenance and safety checks, and if something suddenly goes wrong with covered equipment, customers can schedule a service visit at no charge. Each protection plan is designed to cover individual systems in your home like heating, cooling, plumbing and electrical, making it easy for homeowners to customize coverage to their specific needs. For example, if you have an aging furnace and a brand new air conditioner, you might select a maintenance and repair heating plan, but a maintenance-only plan for your cooling system. A home warranty is an all-in-one policy that covers a whole home's worth of systems and appliances at once. Home warranties can guarantee repairs and replacement, but unlike protection plans, they don't cover routine maintenance. There is also a small trade call fee for service appointments. Home warranties allow you to maximize coverage and offer valuable, broad protection across virtually every area of the home, as well as the convenience and peace of mind of knowing that professional service is just a phone call away, 24 hours a day. Why Is Additional Coverage Important? 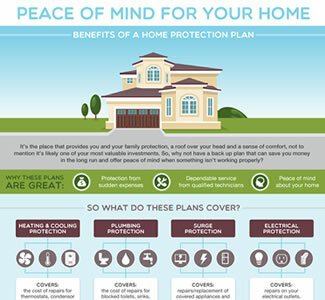 Protection plans and home warranties cover systems that are vital to daily living. When one of these systems has a problem, there's no need to add the stress of reading customer reviews or calling around for price quotes from contractors. These plans eliminate the worry about cost or quality of service. Even do-it-yourselfers can benefit from an extra layer of protection on the most complex items in your home, like your furnace, air conditioning or electrical system. Working on these systems without proper training can make a small problem worse, and can even be dangerous. Protection plans and home warranties are sometimes offered as incentives during the homebuying process. Not all sellers initially offer these perks, but if you want the added coverage, it's fine to ask the seller to provide one, or to offer to split the cost with the seller. Costs vary based on the services offered and what is covered. It's helpful to weigh the cost of a plan against the cost of potential repairs. A whole-home plan that costs $500 per year may be cheaper than the cost to cover typical mechanical breakdowns a homeowner experiences in a year. According to the University of Illinois Extension, homeowners should expect to spend 1 to 2 percent of the purchase price of their home each year on maintenance and repairs — that's between $3,000 and $6,000 annually if your home is valued at $300,000. If you have an older home with systems that will need replacement, U of I Extension suggests it will cost twice that. Replacing major systems including parts and labor adds up quickly. When choosing a protection plan or home warranty, it's important to do your homework and make sure you are getting a plan that covers what you need. If you have questions, a plan provider should walk you through the details of the plans you're considering. It's important to understand what is and isn't covered under the terms of your contract. Be sure to read the terms and conditions, and pay attention to the duration of coverage, options for extending coverage and the terms for changing or canceling plans so you'll know exactly what to expect. Direct Energy has flexible coverage options to suit every home. Browse our home protection plans, or learn more about a whole home warranty from Home Warranty of America, part of the Direct Energy family of companies.